It may be a little hot these days for a casserole-type recipe, but this dish bakes in only 20 minutes. Next time you make penne pasta, double it up so you have leftovers to use in this recipe! If using fresh cooked pasta, cook penne til al dente, drain, rinse and set aside. Meanwhile, in a large pan, lightly spray with olive oil and brown zucchini slices on both sides, til soft but not over-cooked. Set aside, then add the 1 Tbsp olive oil to the pan and stir fry artichoke hearts with the garlic. Add in the cooked penne. Stir in pesto sauce. Spread on the bottom of a medium-sized baking dish (mine was about 6x12"). Layer the zucchini strips in one layer ontop of the pasta. Lightly sprinkle with salt. In a bowl, combine the breadcrumbs with the extra virgin olive oil; season with herbs. Sprinkle 1/3 of the crumb mixture over the zucchinis. Then layer mozzarella or crumbled goat cheese on top of that. Grind pepper over top. Layer with the sliced tomatoes and season with sea salt and pepper. Sprinkle the remaining crumbs over the tomatoes. Bake the gratin at 350F until it is bubbly and hot, about 20-25 minutes. Serves 4. Great with a big green salad! Inspired by the gluten-free goddess at Karina's Kitchen. VARIATION: Instead of baking with a penne base, you can also serve the pasta as a side dish instead. In this case, double up the amount of zucchini to have 2 layers at the bottom of the baking dish, and top with garlic artichoke saute before sprinkling with seasoned crumbs. *I made my own wheat-free breadcrumbs by placing 4 slices of spelt bread in a 200F oven until they dried out thoroughly, then I cooled them and crumbled them coarsely into a food processor and ground it up, adding in the olive oil and herbs while I was at it. Looking good in the picture. It would be a delicious food. I will make this recipe today. By the way, this dish can be made vegan simply by omitting the cheese. 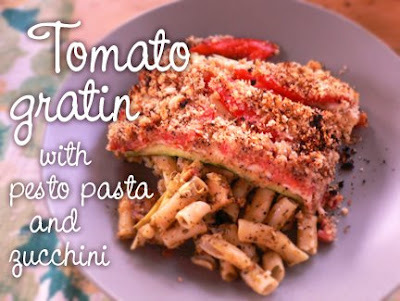 You might want to add an extra drizzle of olive oil over the whole dish before adding the final layer of crumbs!